Not much to comment on....looks like a typical red giant spectrum....little blue companion totally eclipsed? That is a very nice LISA spectrum. Would you be happy to send me the FITS file so that I can measure the Equivalent Width (EW) of the Hα emission and compare it to my own ALPY measurement on the same night? In principle the EW should independent of the resolution. 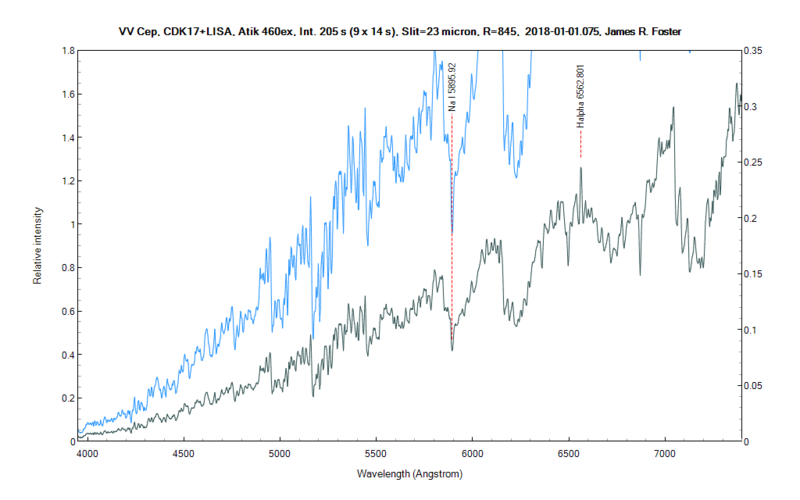 Based on spectra and comments posted under some of the other VV Cep 'topics' on here there seems to be a concensus that the little blue companion went into eclipse a couple of months ago. The much larger Hα emission region around the star still seems to be shrinking in our line of sight. It'll be interesting to watch over the next days whether the emission eventually plateaus or is completely eclipsed. Clear skies are in short supply though here in southwest England! Hope your English weather improves! Let me know if you don't get an email with a link to the .fit file of VV Cep. I think our weather is turning "English" with rain foretasted the next 2-4 days. the blue companion is no longer contributing to this line and the shorter wavelength bands. Latest update to my chart of Hα and Hβ Equivalent Widths. Thanks Jim Ferreira and James Foster for providing their spectra so that we have much better sampling of the two curves. The Hα curve had been showing a general decline overlaid by periodic re-brightening in line with Ernst Pollmann's high resolution results. The latest results are deviating from that pattern. Perhaps a sign that deepest eclipse of the Hα region has now been reached? in order to compare your graph with the total ARAS EW monitoring, I have drawn it for the same time section as yours. As you can see, there is an certain agreement of the variabilty in your diagram to ours. The deviation of yours to the ARAS monitoring is caused maybe by the clear lower spectral resolution of your used spectrographs. The integration interval of EW determination of the ARAS monitoring is between 6551 to 6573 Angstr. The accuracy of the EW measurements is (+/-) 5%. Could you say something about the interval and the accuracy in your diagram?